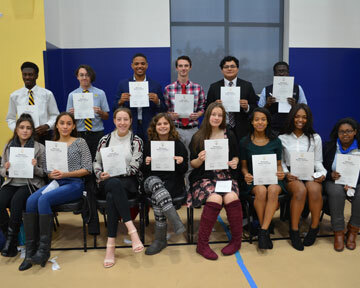 The National Honor Society is the nation’s premier organization that recognizes outstanding high school students and 14 students from the Classes of 2019 and 2020 have been inducted into the DePaul Cristo Rey High School Chapter. The juniors and seniors were selected after an application and review process in which they were required to demonstrate their excellence in the areas of scholarship, service, leadership and character. At a schoolwide induction ceremony on November 16, Michelle Semancik, social studies teacher and NHS moderator, explained that the inductees had to meet a minimum grade point average, have sterling discipline records and documented service activities.